Kwikool portable commercial Air Conditioning products are primarily found in North America, because they are manufactured in Texas. 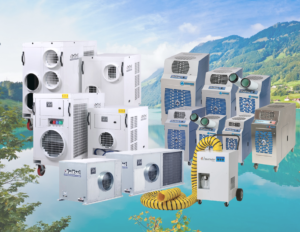 Their primary focus is high quality Portable Air Conditioning designed to the highest of standards while providing exellenct performance and reliability at a valued price. Kwikool offers portable air conditioners for commercial applications with products ranging from 1 tons to 12 tons in capacity. Kwikool products feature round the clock temperature control in a well built, slim profile unit designed for durability. Kwikool’s lines of more than fifty unique products are specifically designed for every industrial or commercial requirement. We have specialized products you won’t find anywhere else. Wether you are caring for a server room, operation theater, laboratory, work site, school, retail store, restoration site, office building or house of worship, indoor and outdoor Kwikool will equip you with the right product today. Satisfaction guaranteed.